Alongside the iPad 2 launch last night, Apple also revealed a handful of new apps ready to be downloaded alongside the new slate. We’ve written an in-depth guide to the new Garageband app, which you can read by clicking here. Garageband for iPad has the potential to totally democratise music making. Not only will you not need an expensive PC rig to write hit tracks, as all the hardware and software you’d need can potentially be housed in the $499 tablet, but you need not have any real musical skill either. Smart Instruments, easily allowing novices to lay down pleasing chord progressions with a number of instruments, will allow any iPad 2 owner to become musically creative. Forget bedroom recording, the iPad 2’s mobility will create a whole new wave of street producers. That’s not to say Garageband is purely for beginners. Here Tech Digest list 10 successful bands and artists who use the program on Macs, and will undoubtedly make the jump to the iPad 2 when on the road too. Im a music producer and I love to use garage band so wats the legal aspect of making a hit song using garage bands sound bank? I really would love to see the list of the “Top10 Successful bands,” I can at least get motivated that I can achieve it also.?! fallen emos? an idiot wrote this article. wow, i just got my new ipad and i am now, even more confident in buying garageband. cant wait! i really cant wait. i want to start recording my music and be the eleventh artist on your list!!! The exolife iPhone battery case is a sleek, protective exoskeleton for the iPhone 4, outfitted with a rechargeable external battery to give your iPhone the extra power that you need. Thanks for your article, I enjoy it very much! 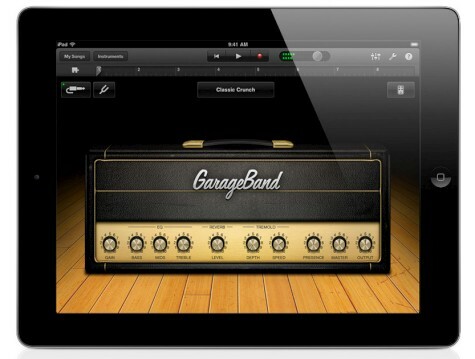 garageband would make it easier for musicians to make music. I came to your article from another article and am really interested in this learning about this.I feel strongly about information and love learning more on this. If possible, as you gain expertise, It is extremely helpful for me. Cant believe how popular garage band has got, its pretty huge atm eh?